Crowds flock to the town for the concert and in the cove of Portbò (where the stage is set up) you can't see the sea for boats, with people keen to enjoy the show from the water as well. We are privileged to host a wide variety of wonderful musical events, some of which have become permanent fixtures in the country's cultural calendar. 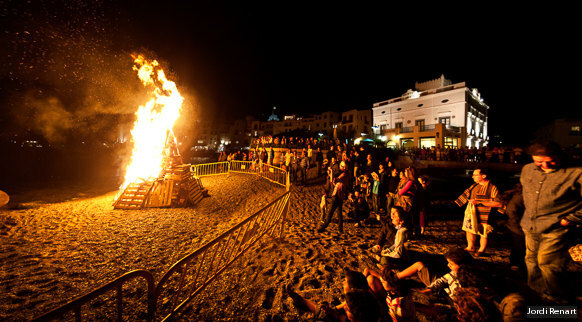 Rockets and firecrackers are launched from sa Palomera, a large rock that separates the two beaches of the town of Blanes. Autumn tastes of chestnuts and panellets (little round marzipan cakes). These two products provide the flavour in Catalan gastronomic culture when autumn brings vibrant red and yellow hues to forests and the days draw in and get chillier. Just wander around streets of any town and let the music and firecrackers guide you to one of the open-air parties, where you'll find a warm welcome. For a few days, the colours and aromas of flowers fill the squares and streets of the city of Girona. This is a solemn and moving event that normally begins after dark. The various scenes are enacted in some of the most prominent areas of each town, such as mediaeval old quarters, while others take place in outlying areas, in the heart of nature. Come and experience all the emotion of the Catalunya World Cup. The Three Kings and the royal pages parade through the main streets of cities of towns on their floats, leaving a thick trail of sweets behind them.